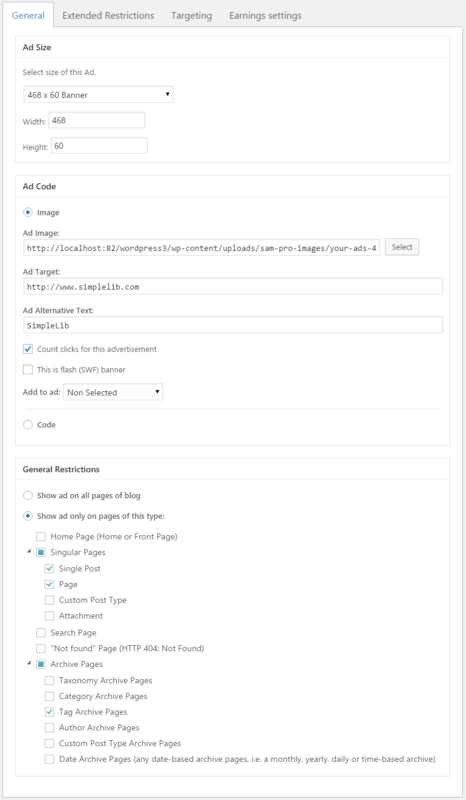 The Ad is the Ad Object that contains all the advertisement properties required to display this ad on the pages of the site depending on the set of its own rules and conditions of the currently displayed page. This object along with the Place object is one of the main objects of the SAM Pro Free plugin. Ad Editor is just the online editor of object Ad. Name – it is preferable to choose unique names for each ad. 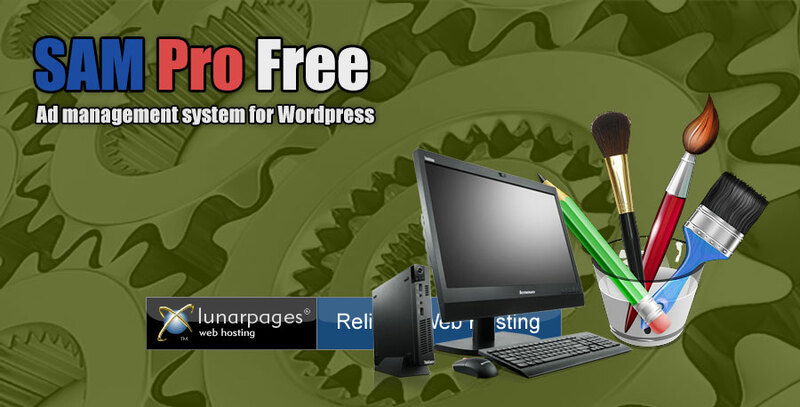 Description – If you are admin of site and you are creating your own ad you should know that this description is not used anywhere and is added solely for the convenience of managing advertisements. But if you are advertiser you should briefly but more fully describe your ad. This will help expedite the process of moderation of your ad. Ad Size – This is size of currently edited ad. 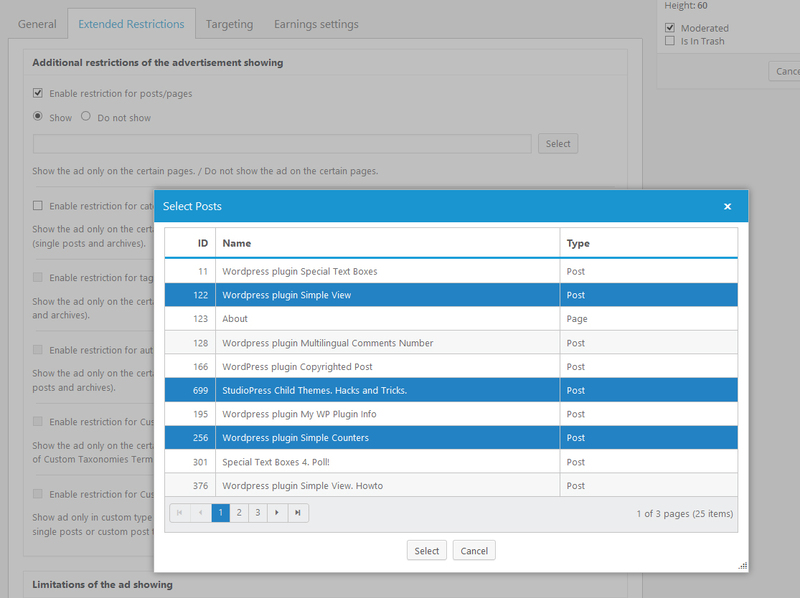 You can select one of predefined sizes or select Custom Size and set your own values of width and height of ad. Ad Image – URL of ad banner. Select button – Clicking this button will open WordPress Media Library dialog where you can select already uploaded banner image or upload and select new banner image. 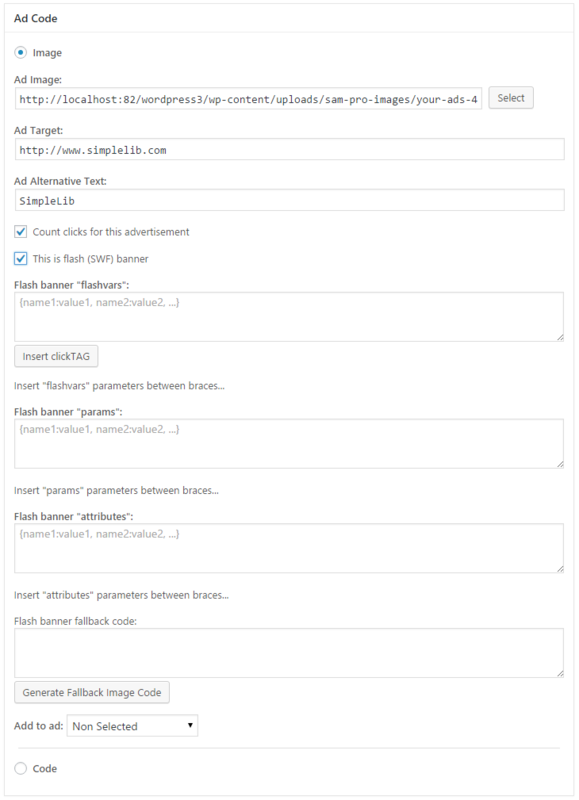 Ad Target – target URL of ad banner. If filled for using with ad flash banner, it will be the target URL without using clickTAG or defined inner target of flash banner. Inner target and clickTAG will be blocked. Ad Alternative Text – alternative text of ad banner. This is flash (SWF) banner – this ad is flash banner (not image). Flash banner “flashvars” – Here you can define flashvars for your flash banner. Click button “Insert clickTAG” for moving Ad Target to flashvars as clickTAG parameter (Ad Target field must be filled). Flash banner “params” – Here you can define params for your flash banner. Flash banner “attributes” – Here you can define attributes for your flash banner. Flash banner fallback code – defines flash banner fallback image. “Generate Fallback Image Code” button opens WordPress Media Library dialog for selecting fallback image. Show ad on all pages of blog – this ad will be shown on any page of the blog if it is allowed by the extended restrictions. If there are not defined extended restrictions, the ad will be shown on all pages of the blog. 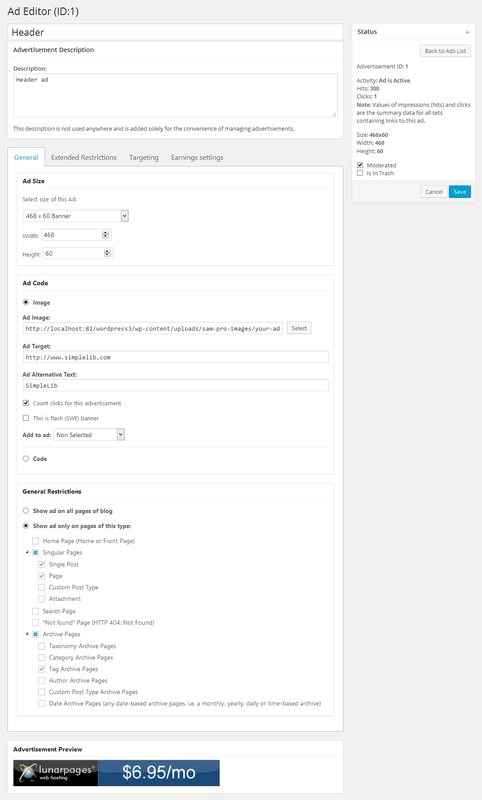 Show ad only on pages of this type – You can restrict the showing of ad by page types. Just turn on appropriate checkboxes of page types in the Page Types Tree. Before using any of extended restriction you should turn it on on the settings page. 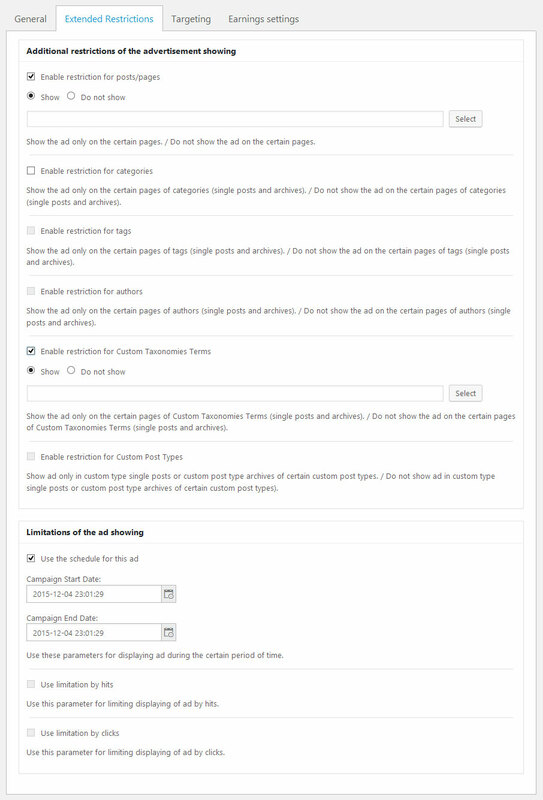 You can restrict the showing of the ads by post/page Ids, categories, tags, authors, custom taxonomies term and custom post types. There are two mode of using the additional restrictions: “Show only on” or (not and) “Do not show on”. These restrictions of the showing are applying to relevant archives (excluding post/page Ids) and to the single posts pages if this page contains properties, subjects of the restrictions (defined tags, categories, etc.). Enable restriction. Select restriction mode (show, do not show). Fill field by posts/pages ids (comma separated) or Select posts/pages from the list. Data grid multiple rows selection is allowed. Through page selection is allowed. Ordering by ID/Name/Type is allowed. Mode “Show”: This is the only rule that has ambiguity in use. In order to your ad has been shown only on selected posts/pages, you should also check the box “Show ad only on pages of this type: Single Post, Page” (see General Restrictions). Fill field by slugs of categories (comma separated) or Select categories from the list. Data grid multiple rows selection is allowed. Through page selection is allowed. Ordering by ID/Name/Slug is allowed. Fill field by slugs of tags (comma separated) or Select tags from the list. Data grid multiple rows selection is allowed. Through page selection is allowed. Ordering by ID/Name/Slug is allowed. 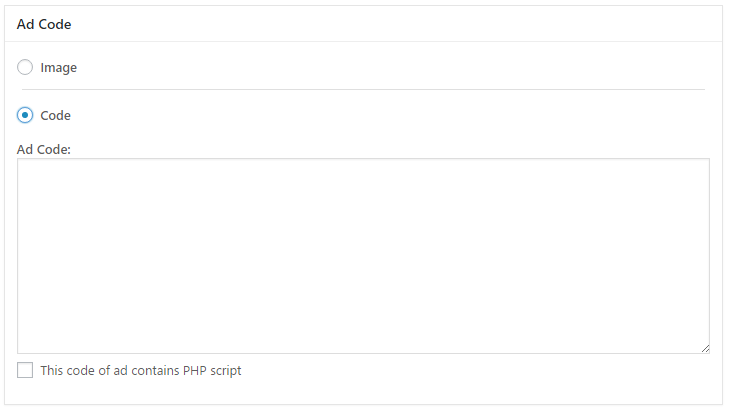 Fill field by slugs of authors (comma separated) or Select authors from the list. Data grid multiple rows selection is allowed. Through page selection is allowed. Ordering by ID/Name/Slug is allowed. Fill field by terms (comma separated) or Select terms from the list. Data grid multiple rows selection is allowed. Through page selection is allowed. Ordering by ID/Term Name/Custom Taxonomy Name is allowed. Fill field by slugs of Custom Post Types (comma separated) or Select slugs from the list. Data grid multiple rows selection is allowed. Through page selection is allowed. Ordering by Custom Type Tytle/Custom Type Slug is allowed. Enable the limitation. Set Start Date and Finish Date to schedule the showing of this ad. This limitation is enabled by default for the ads of third-party advertisers. Enable the limitation. Set amount of the ad impressions. Enable the limitation. Set amount of the ad clicks. Exclude these users – Fill field by slugs of registered users (comma separated) or Select users from the list. Do not show this ad for advertiser – if registered user is the advertiser the ad will be blocked. Advertiser Name – The name of advertiser. Advertiser e-mail – email of advertiser. How will look your ad after publication. It is convenient when you use the “code” mode. What’s the option “Count clicks for this advertisement” used for? It is not used at all. It means that you see outdated screenshot. So in any caso this option should be ignored right? This option is ignored by the plugin. I just forgot to remove this option from the editor. I switched from Ads Simple to Sam Pro Free. Migration is ok. But i have a problem if i try to create a new ad: i can set a schedule, but i can’t enable hit limitation. Except schedule limitation, all checkboxes are grayed out (click limitation, post restriction, etc…). I thought it was available in the free version, isn’t it ?